Q: In which year did Edward VIII abdicate? Why was this Baltimore woman, born in 1896 into relative obscurity, so demonised by the British establishment and wider commonwealth, accused of being a spy, prostitute or Nazi sympathiser? How, after she married the ex-King and became Duchess of Windsor, did she turn her exile and hatred into a platform from which to launch herself as one of the world’s best dressed woman who entertained in the most elegant homes fit for a King - or an ex-King? Was she simply a clothes horse for dress designers and jewellery makers or did she have a heart that has never been fairly understood? Anne is giving a talk in Putney (now FULL), which will include many pictures of Wallis and the clothes and jewellery she had made especially for her. During the talk she will explore new interpretations of THAT WOMAN in an attempt to understand why she was considered unacceptable as Queen of England and of the Empire. 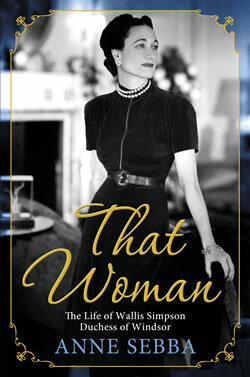 Seventy five years since the Abdication in 1936 there has been an explosion of interest in Wallis Simpson. Can her fascination finally be understood or does it remain elusive? Anne Sebba pictured left is a biographer, lecturer, journalist & former Reuters foreign correspondent. She read History at Kings College, London University and her first job was at the BBC World Services and then six years at Reuters. She has written eight books, several short stories and introductions to reprinted novels. She has presented documentaries on BBC R3 and BBC R4, is a member of the Society of Authors Executive Committee and her latest biography is of Wallis Simpson called That Woman. Not a member? Click here to register before you enter. Unsuccessful? - Anne will be signing copies of her book on the evening where they will be available to buy or you can buy a copy at Waterstone's in Putney Exchange or on Amazon.